“Do you trust Me?” is the answer that I gave when Angie Elkins asked me what God had been teaching my lately in our Enjoy God’s Word Podcast session (tap on the graphic below to listen to the podcast). I realized after a while that God’s reason for asking me this isn’t that I doubted Him or ever knew Him to be untrustworthy. He wants to take me deeper into trusting Him. For the last two years, whenever I’d hear that question in my spirit, I stop whatever I’m doing, sit, get into a posture to receive and hold my hands open in front of me in expectancy. It’s not always a big ask. It could be a thought that I’ve had rolling around in my mind that would take my focus off of how huge He could be in revealing something to me. It could also (and often is) me waiting and seeing what He wants to unfold in my life. Sometimes there’s legitimately a sin in my life that I let get out of control and He wants that child-like faith that woos me back into Him. No matter what….let me say that again….NO MATTER WHAT, God is 100% trustworthy! 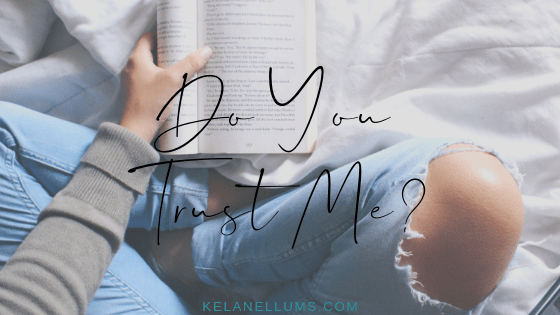 What is it that you need to trust Him in more? Is there an area that you know you need to hand over to the Master? Leave a comment (or email me) and lets talk about it! I have something new that I’ve been working on! I realized that there are many times that I’d like to share something that doesn’t always warrant a full on blog post, but it’s itching in my bones and I’m bursting at the seams to share it with you! Some of you may be saying that it’s about time! And I agree! I’ll come into your email at least once a month sharing what I’m working on, what I’m reading, what God is showing me, what I’m studying, Bible study tools that I enjoy and an encouraging word. or in my blog’s sidebar!